Lanzante has never shied away from a challenge. Or an opportunity. This is the historic road and race car specialist that won Le Mans in 1995 after all, and, more recently, turned the track-only McLaren P1 GTR into a road car. Even among the great and the good of British motorsport, its experience and expertise stands out. So when Dean Lanzante tells you that its latest project is providing its engineers with a long list of never-before-tackled challenges, you know it must be something rather special. Standing in the firm's Hampshire-based workshop, face-to-face with said challenge, other words spring to mind, too. Bonkers is one. Unfathomable is another. Downright mad about covers it. 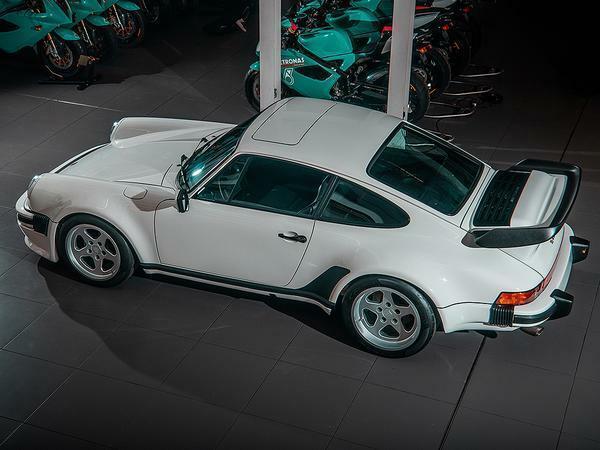 Because what we're talking about here is a Porsche 930 - the original 911 Turbo - with a heart transplant. The donor? A Formula 1 car. And not one of the flat-toned hybrids from the current era, either. We're talking mid-1980s and turbocharged; when 1.5-litres got you more than 1,000hp and all the savage boost the best drivers in the world could handle (or, on occasion, couldn't). 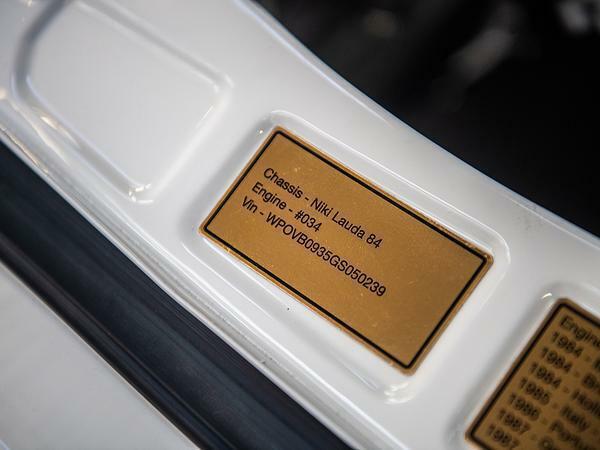 Specifically - and appropriately - the engine in question is the TAG-Porsche unit that powered the likes of Niki Lauda, Alain Prost and Keke Rosberg to 26 Grand Prix victories with McLaren. 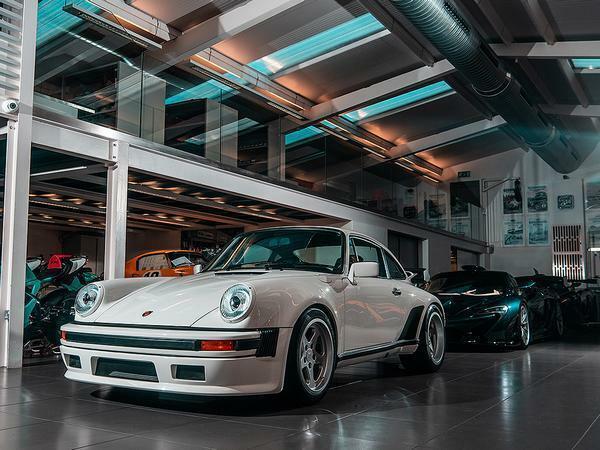 Woking's finest actually produced a one-off 930 with the same turbocharged motor back in the day - it served as Lanzante's inspiration for the project - but the planned production run of 11 cars will be the first to feature engines that have actually competed in races. Not even the forthcoming Mercedes-AMG One can claim to have a podium finisher in the back. All bar two of Lanzante's 930s achieved this feat. One is a winner. 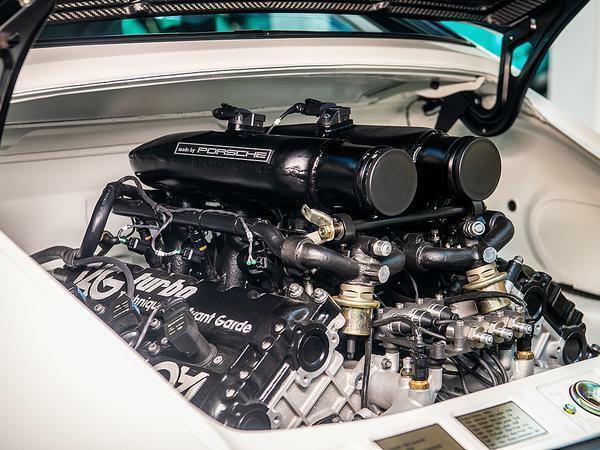 Obviously the job of getting a 35-year-old, highly-strung race-born V6 to work in a road car is the source of more than one technical headache, so Lanzante partnered with Cosworth for the development work. The famed engine-builder did not disappoint, delivering a unit capable of 503hp, 310lb ft of torque and, all importantly, a 9,000rpm redline. 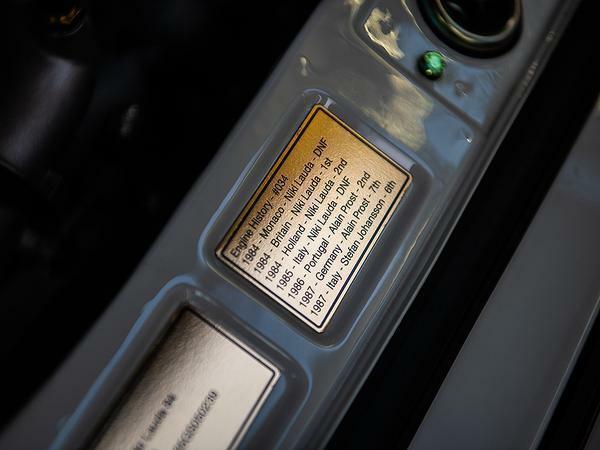 This makes the TAG-Porsche motor - which, before you ask, is connected to the right pedal by a throttle cable - the highest revving turbocharged unit to go into a road car. It won't be all laggy at low revs or scarily boost-happy either; Cosworth's work has focused on adjusting the fuel to air mixture of the V6 racing engine to make it more useable at low speeds. It has also fitted smaller turbos that spool up quicker and added a new crankcase. The result is less power but better drivability and, most importantly in a road car, good reliability. To make doubly sure of the latter, boost pressure has been wound back to three-bar, a decrease of 25 per cent. 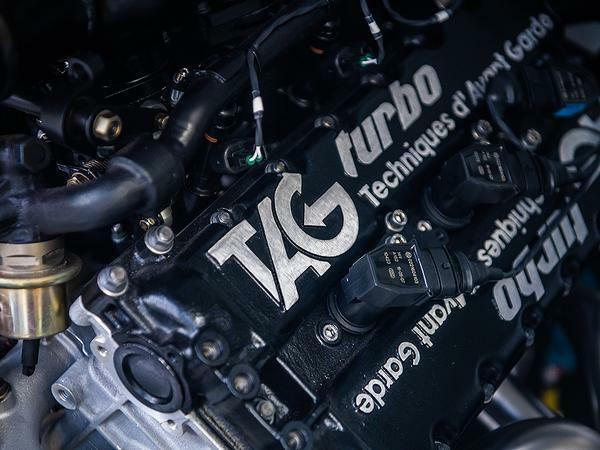 The power and torque curve for the reworked engine suggests all manner of good things. The former has a lovely steady incline to that sky-high redline, implying that it will build and build like all the best naturally-aspirated engines, but not without peak twist being maintained for more than half the rev band - just as you'd expect from a modern turbocharged unit. 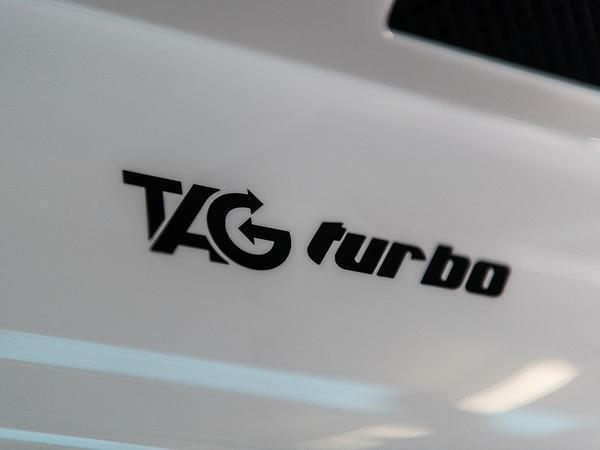 As Lanzante intended, this means you won't be left waiting for a terrifying crescendo, but building progressively toward a terrific one - as you do with the current GT3 RS's scintillating flat-six. The thought of Cosworth's handiwork outdoing that 520hp-at-8,250rpm engine is a compelling one. 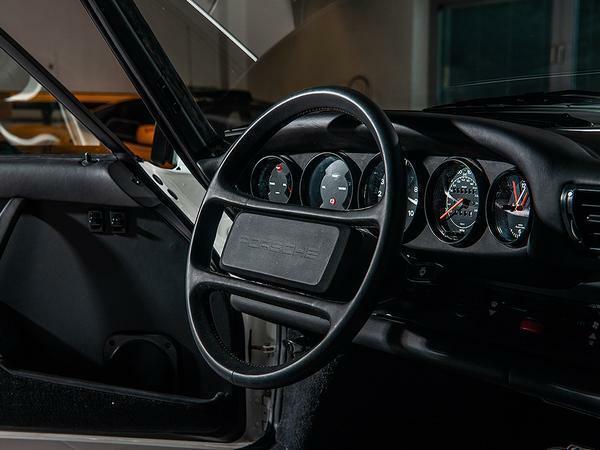 Elsewhere in Lanzante's 930, you won't be surprised to hear that the standard five-speed gearbox, which had only to worry about 330hp at 5,750rpm in Stuttgart's original creation, has been swapped for a newer Porsche G50/20 six-speed transmission, complete with bespoke ratios and a limited slip differential. With the new ratios - stacked closely to top out at 200mph. That means it's faster than a 959, its bigger brother from the 1980s. For Lanzante though, making the engine work in 2019 is just one challenging facet among many. Keeping it cool is arguably an even steeper task, firstly because of its location at the rear of the car, but also because the V6 is now being asked to power a whole range of ancillaries. To reduce the load as much as possible, the team opted to fit electronic climate control, as you'd find in an electric car. Creating an all-new water cooling system in what was previously an air-cooled machine was no less troublesome. With no existing plumbing to innovate with, the engineers decided to mount the radiator low in the front of the car and designed a totally bespoke system for the air to flow through and cool the water. To facilitate this, Lanzante's 930 gets the bumper from a 911 SE flatnose; one with the fogs swapped for holes to feed the oil coolers. The work on this section of the car alone shows just how intricate the job of re-engineering it has been across the board. The workshop staff, captained by programme lead John Webb, have, of course, applied the same level of care to the car's other major mechanical components. 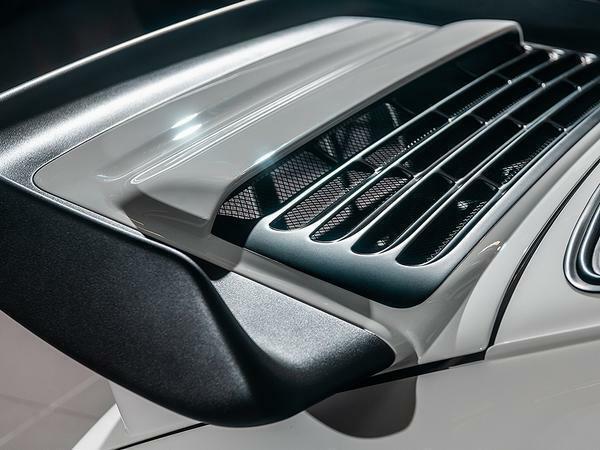 Lanzante's 930 now incorporates coilovers, which have been set to match the car's extra performance while still providing recognisable 911 handling - it's said to be more predictable than the original Turbo, but still wild - and carbon ceramic brakes are on the cards, although the callipers will be the originals. The tyres are modern Pirelli P-Zeros (225 front and 255 rear) wrapped around those lovely, original 17-inch wheels. There's no traction control, by the way, not because Lanzante couldn't work it in, but because the team didn't want to. This is to be a proper driver's car. One that will demand respect. 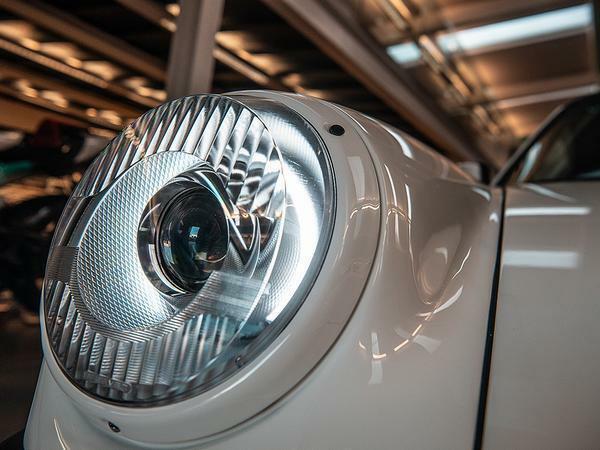 Naturally, with racing in its blood, Lanzante also sought to make its 930 as light as possible. 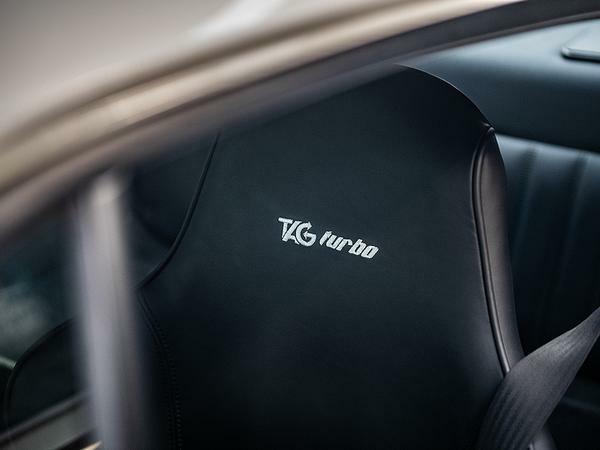 The engine itself is 100kg lighter than the original Turbo 3.3-litre flat six, but further weight has been saved with the fitment of a carbon fibre bonnet and engine cover, the latter of which is bespoke with new vents. The door skins are also aluminium, which has the new car tipping the scales at around 1,100kg - some 235kg lighter than the original car. 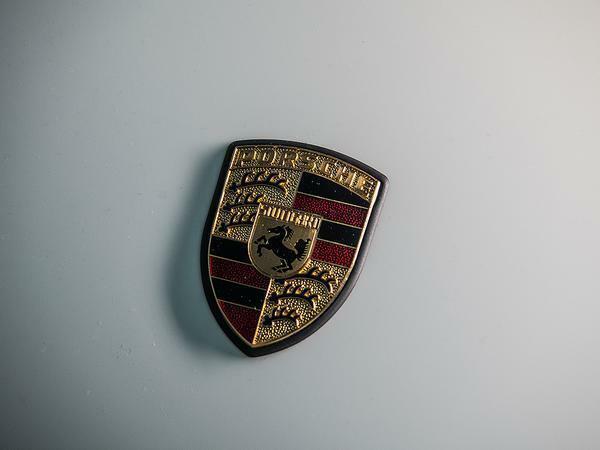 Power-to-weight is rated at 457hp per tonne, which makes the 930 95hp per tonne better off than the outgoing 911 Turbo S, a car with twice the driven wheels and absolutely no shortage of forward momentum. In engineering terms then, it's fair to describe this as a complete overhaul. Lanzante, though, is keen to preserve some sensation of originality in its limited-run cars, so has opted to minimise styling alterations. 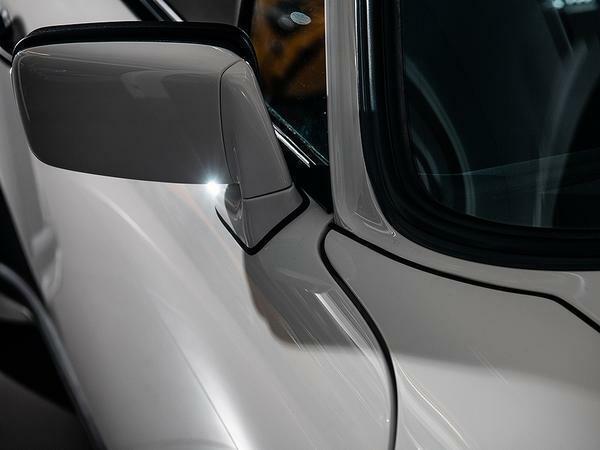 Its 930 will only be available in Porsche colours, and the trim options are said to be the same as those offered by the factory when new. 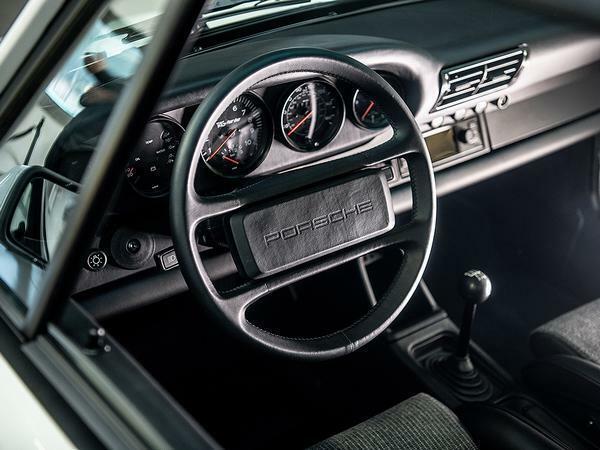 That means leather and vinyl, as well classic Porsche patterns are present, but modern stuff such as Alcantara or carbon dash parts are not. Lanzante's first car has Recaro Pole Positions re-trimmed with fabric that mimics the look of 930 chairs. 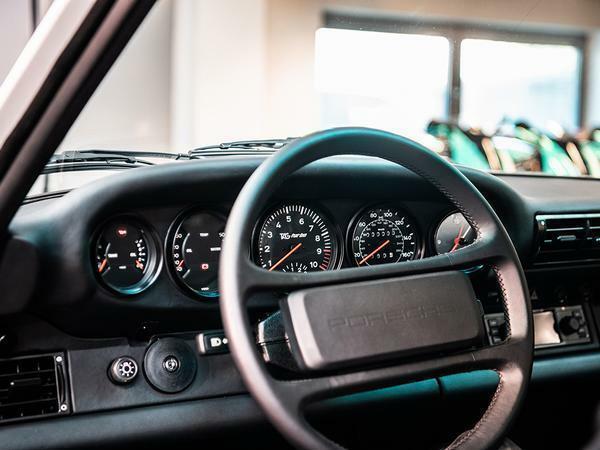 It all feels very period, although there are two USBs nestled at the bottom of the centre console and a retro-looking radio with a small satnav screen - supplied by Porsche Classic - to enhance the car's usability. 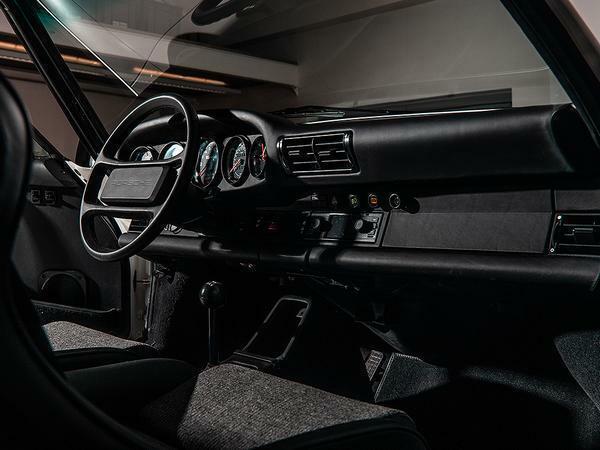 The dead giveaway, of course, is the addition of a water temperature gauge and the tachometer which now displays a 9,000 redline. Oh and there's a little TAG-Porsche decal on the instrument cluster as well. Just to get your blood racing. Sadly, there will be no starting the engine today - it's not fully plumbed in yet. Which gives the static 930 the physical presence of a sleeping tiger. We won't hear the V6 in situ until the car gets its dynamic debut at the Goodwood Festival of Speed, although Lanzante has two extra engines - one to keep as a spare and another for dyno work - which PH hopes to hear a little sooner. For now, all assumptions about what the car sounds like are based on racing footage from the Niki Lauda's McLaren. Which makes it the coolest thing ever. It'll also be among the higher priced things, too. The cost is £1,095,000 plus taxes, which includes the donor car and all spec options. Just who gets one is still to be decided, although the emphasis will be on picking customers from around the world who are 'best' for the 930 - most notably those buyers who can be relied upon to take the car along to events in different regions so that others might appreciate the level of effort that has gone into it. Certainly, Lanzante's feat of bespoke engineering is well worthy of the spotlight - for more reasons than one. "It's a car that celebrates history, the history between amazing brands," Dean says. "But it will remain extremely rare because it has to be. We couldn't get any more engines from McLaren, so this is it. There will never be another car like it." Interesting concept and obviously great execution. At the same time, I'm a little bit 'meh' even though I fully understand and respect the effort and racing connections involved. 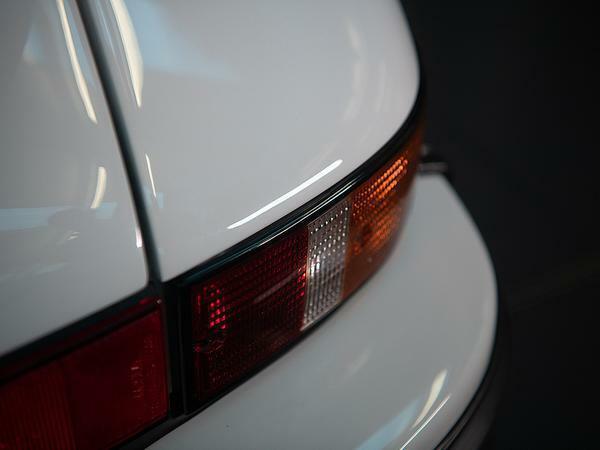 Maybe it's also the fact I've never really been a big 964 fan either! Porsches do little for me, but that one.. wow. Love the period rev counter..
964 and a Tag Turbo F1 lump. Wow! Love how standard it all looks too. 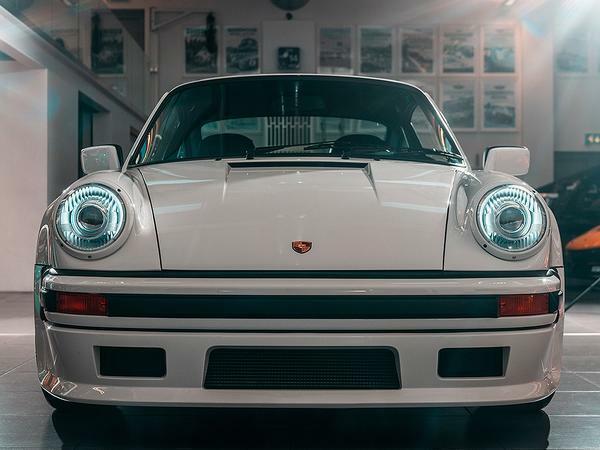 It's not based on the 964, it's based on the 930 3.3 turbo which preceeded it upto 1989. Bit of a handfull but unlikely to be driven in anger, more of a collectors museum piece. “It has also fitted smaller turbos that spool up quicker and added a new crankcase.” It’s not really an ex F1 engine imo. Original pistons, crank, cams etc etc? It’s still a lovely car and a great example of what they can do, but it’s not what the headlines promise.